Wow. Guess you really can buy anything online these days. 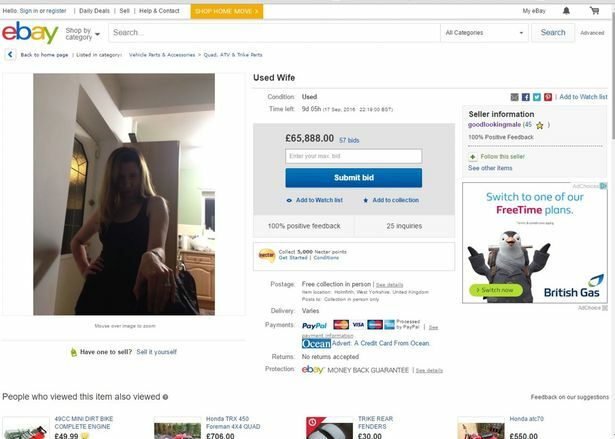 A British man who came home one day feeling ill was so irritated by his wife's lack of sympathy that he decided to put her up for sale on eBay. Though Simon O'Kane made the listing as a joke, bidders seemed quite serious about the auction, according to Mirror. In the listing, O'Kane described his wife, Leandra, in used car terms, saying, "for sale one wife. Not new has been used but still got some good miles left in her." "Good points: Body work and paint work still in decent shape..." he further noted. "Bad points: Often makes this noise that cannot be silenced unless you order brand new shiny parts of metal." By the time the listing was removed, offers to buy Leandra had escalated to upwards of £65,000, or $85,000. When Leandra found out about the prank, she was far from pleased. "I was absolutely fuming. I wanted to kill him," she told Mirror. "Everyone at work saw it and were laughing their heads off. Not only did he put me up for sale but he used such a bad photo." O'Kane said that although they did receive a few "pervy" messages from potential buyers asking to see more photos, most of the responses they got just made them laugh. "We both liked the guy looking to exchange her for a camel, and the guy trying to work out how much bacon he could get really got us howling," he told Metro. And though O'Kane admitted he wonders how much the listing would have reached if it had not been removed, he says he cannot stress enough that it was all just a joke the entire time. "It wasn't like I'd actually let someone have her," he said. "She's too good."